KEYS is a registered charitable organization committed to helping our adult family members and friends with intellectual disabilities reach their full potential. 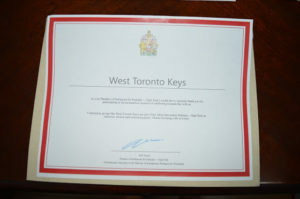 In 2012, KEYS was nominated for and received the Business, Community and Agency Award at the Provincial level. The award was presented at the annual conference of the Council for Exceptional children in Niagara Falls on November 30. 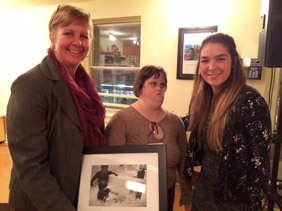 On March 1, 2013, two members of the Council for Exceptional Children attended the KEYS Community Lunch and presented the award to President Helene Paulyn-Murray, vice-President Maryanne Bruni, KEYS Coordinator Jenny Saundercook, and the KEYS participants. Awarded by the Ontario Provincial Member of Parliament for Parkdale-High Park, Cheri DiNovo. Awarded in June 2016 by Habitat for Humanity in recognition for our KEYS participants volunteer efforts at ReStore in Etobicoke. Awarded by Parkdale-High Park Member of Parliament Arif Virani. 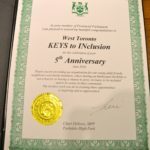 West Toronto KEYS to Inclusion was the recipient of this award in October 2015. KEYs to INclusion. © 2018 All Rights Reserved.